This week we had Little Hare’s second Listener, his first being based on Housman’s “When I was twenty-one…” from A Shropshire Lad . Here we had a title that made me think of an Agatha Christie novel, which wasn’t surprising given the number of books she wrote, most of them about death — Death in the Clouds, Death on the Nile, Death Comes as the End, etc, etc. Unfortunately, Death in the Afternoon wasn’t one of them. That was by… but I jump ahead. 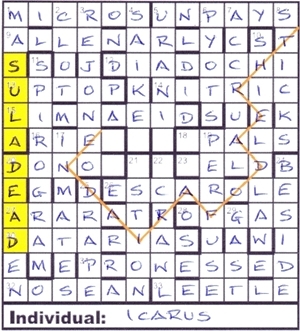 In four clues, we had to remove a string of letters and unjumble them to reveal “four connected individuals.” Twelve others had misprints in their definitions. That left twenty that were normal. Unfortunately, most of the remainder of across clues left me floundering. 16ac Uses the rawhide strip that is discovered in Madagascar (4) and 23ac Ed’s worked back in Middle Temple (4) obviously led to RIEM (IE in RM) and TELD (hidden reverse), although I failed to note the extra letters in the former and misprint in the latter! As it was, the left-hand side of the grid came together much quicker than the right, where there were some devious clues. Top of the list was 28ac Rebuffed son accepted girlfriend over late gala: dad sues regulator (5) which made absolutely no sense at all. In fact, it turned out to be my favourite clue with Daedalus needing to be removed to show the clue as Rebuffed son accepted girlfriend over late gala: dad sues regulator (5)! For me, that last clue needed almost a full grid and the phrase to be discovered from misprint corrections: Ariadne’s clue. We were in the land of Theseus, his labyrinth and the Minotaur. 1ac did not, in fact, contain the jumble of one of the individuals, being just an anagram of COM (for committee) and RIS. The other characters were revealed by 16ac with its anagram of Uses the, 31ac With Darius, caring for wild herbs possessing hollow stalks (9) for PROWESSED but missing Icarus* and 8dn Remains near aid and bows (6) for STICKS and Ariadne*. The clue in the message referred to the meaning given under clew in Chambers: “a ball of thread, or the thread in it (archaic)”, which was used by Theseus to retrace his steps in the maze. It didn’t take long to find THREAD OF ARIADNE in the grid, snaking down from STICKS and ending in a middle arena. I have to say that I found the use of the word arena a bit confusing. I guessed it was just referring to the central region, with its arrangement of bars perhaps representing the labyrinth but I wondered if it had a deeper meaning. Anyway, there was the MINOTAUR reading left then right and needing to be erased. DAEDALUS, on the other hand, who supposedly designed the labyrinth, could be seen running up column 1. That just left ICARUS (“who does not survive”) to be entered beneath the grid. The title referred to a book by Ernest Hemingway on the tradition and ceremonies of bull-fighting, supposedly one of the best on the subject. Who am I to argue. Thanks for a fun puzzle, LH. This entry was posted on 3 August 2018 at 4:00 pm	and is filed under Solving Blogs. Tagged: Death in the Afternoon, Little Hare. You can follow any responses to this entry through the RSS 2.0 feed. You can leave a response, or trackback from your own site.